My grandmother used to make the best Deviled Ham using leftover ham roast. She’d grind ham in her meat grinder and add some of her homemade Mustard Pickles, which is kind of like Chow Chow relish only hers was the world’s best, seriously. Then she’d serve deviled ham sandwiches to my brothers and me while we’d sit by a tiny record player she had stashed in a lower kitchen cupboard- Because don’t all awesome grandmas have a record player on its own secret shelf in their kitchen? I remember listening to stories-on-LPs like Rose Red (the truly original Beauty and the Beast) and Snow White. I’m sure we had other things for lunch while listening to these stories, but I can vividly picture the classic taste, smell, and texture of deviled ham sandwiches. And I’m pretty sure I listened to Rose Red hundreds of times, I can still remember it vividly. My grandmother, the original Good Dinner Mom and best grandma ever, has been gone for over 30 years now and no one makes her Mustard Pickles anymore (It’s quite an involved recipe and I made one attempt several years ago- after I put in the hard work, I had several beautiful jars of waaaay too salty Mustard Pickles that were inedible). ANYWAY… this recipe is the closest I’ve come to the original that I remember as a kid. The combination of scallion, sweet relish, and whole grain mustard is perfect for texture and just enough mustardy taste. Cream cheese and mayo creams it all together and a dash of hot sauce and lemon juice brightens the whole thing. Cayenne pepper does heat it up though- so leave that out if you don’t want it. We loved it with the cayenne. Parsley adds color and freshness. I did wonder if one of the reasons that I loved this recipe was because of the precious memory it brings back about my grandmother (I’ve got a lot of those, like her famous Macaroni and Cheese). But while I was taking pictures of the deviled ham for this post, I could hear my husband scraping out the rest from the bowl in the kitchen as he kept exclaiming how good it was. If you knew Dave, you’d know that’s saying something. So, I’m confident you’re going to love it even without a special childhood memory attached to it. 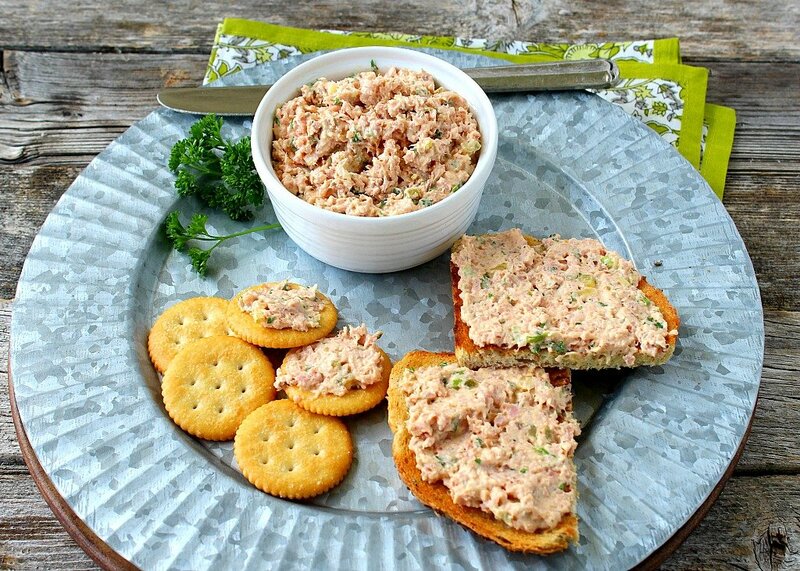 Better than any canned ham spread, and if you don’t have any leftover ham roast, Deviled Ham works great with any good-quality deli ham. 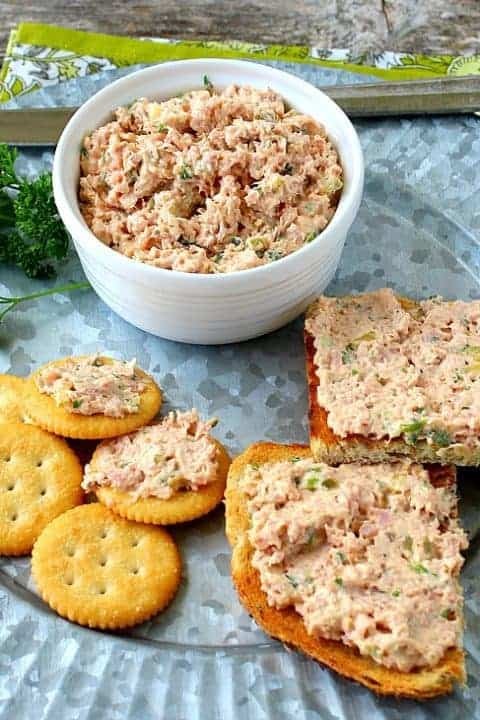 It only takes a couple of minutes to mix together and you’re gonna love it, whether you had deviled ham as a kid or are just trying it for the first time today. As you can see, the Deviled Ham is excellent on crackers or open-faced toast or sourdough… however, my favorite way ended up eating it straight off the fork. 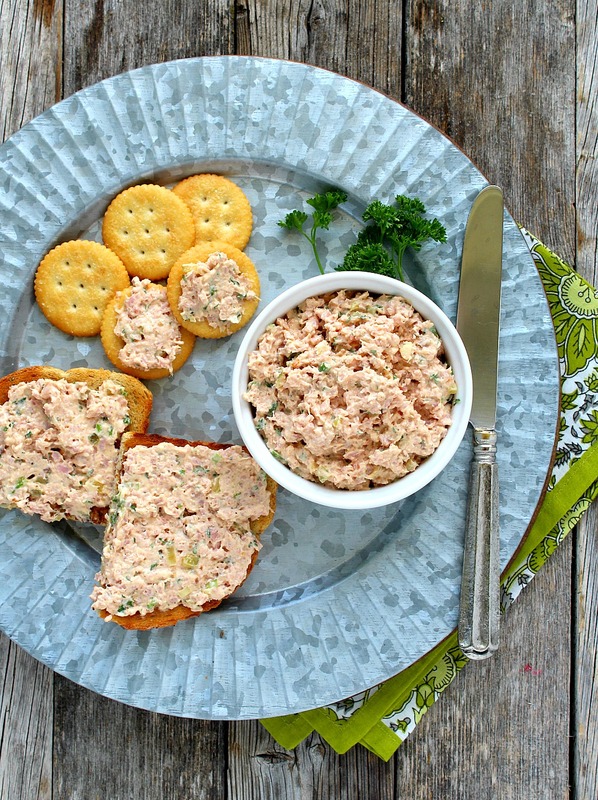 This Deviled Ham spread is perfect for leftover ham or can be used with any good deli ham. 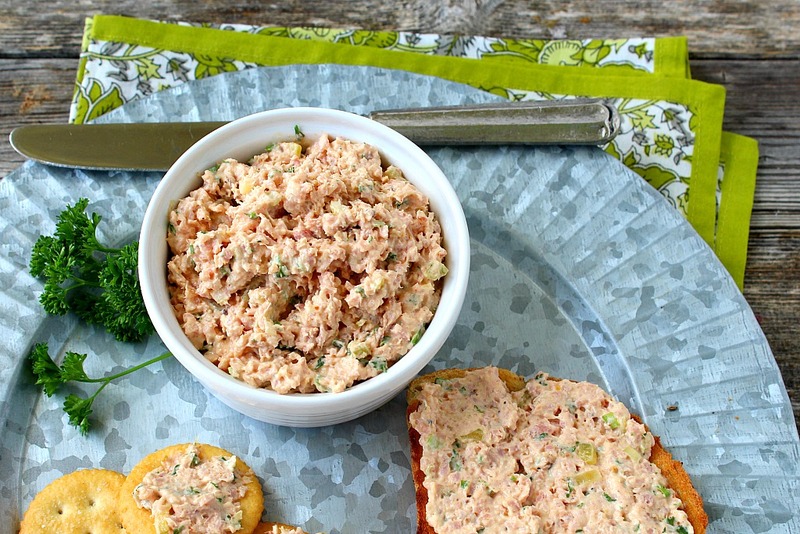 Great served on crackers or toast and is a fantastic sandwich spread on crusty bread. 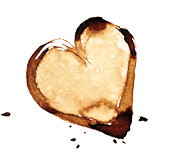 Suggested uses: Serve with crackers or toast as an appetizer or also makes a delicious sandwich spread on sourdough bread. 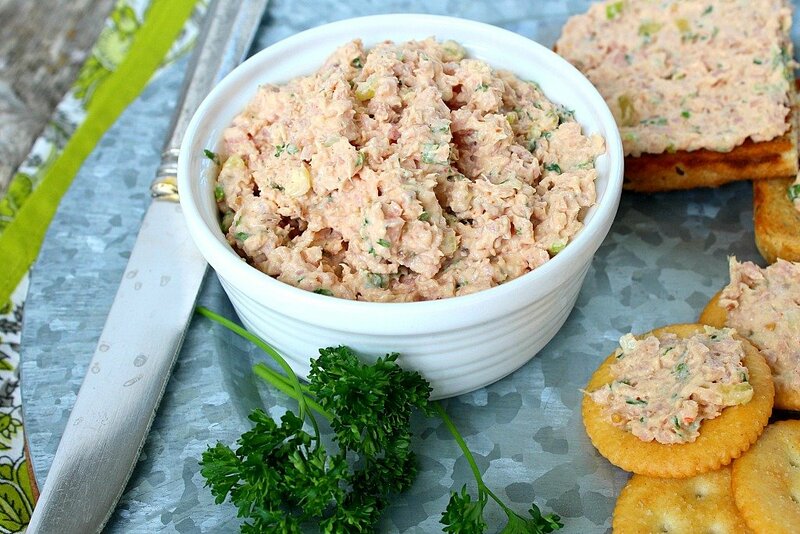 Pulse 8 ounces coarsely chopped country ham or good deli ham in a food processor until finely chopped. Transfer to a large bowl and add all the remaining ingredients except salt and black pepper. Add salt and pepper to taste being careful not to overly salt the mixture. Serve immediately or refrigerate up to two days for serving on crackers or toast. Also makes a great sandwich spread on sourdough bread. Cook's note: The hot sauce will not add heat to the mixture, it adds a much needed brightness. If you like, add a dash at a time but I highly recommend adding it. The cayenne will definitely add a kick, so use less or leave out if you like. This recipe is awesome! First time making it and my man loved it and he’s really fussy about the taste!! Yummy! This is a must try! Flashback! This looks,and sounds so scrumptious I can’t wait! Thank you Jay! For me, this recipe gives one of my favorite flashback memories. Hope You like it. Thanks for stopping by, it means a lot.